(COMING SOON) Launching this fall, LandiesCandies.com will soon allow you to purchase chocolates, gift baskets and more for yourself, family and friends. In the meantime get a free gift card. Landies Candies provides some of the biggest names in retail with private label solutions and products that are second to none. All of our products are made in our chocolate factory in beautiful Buffalo, New York. 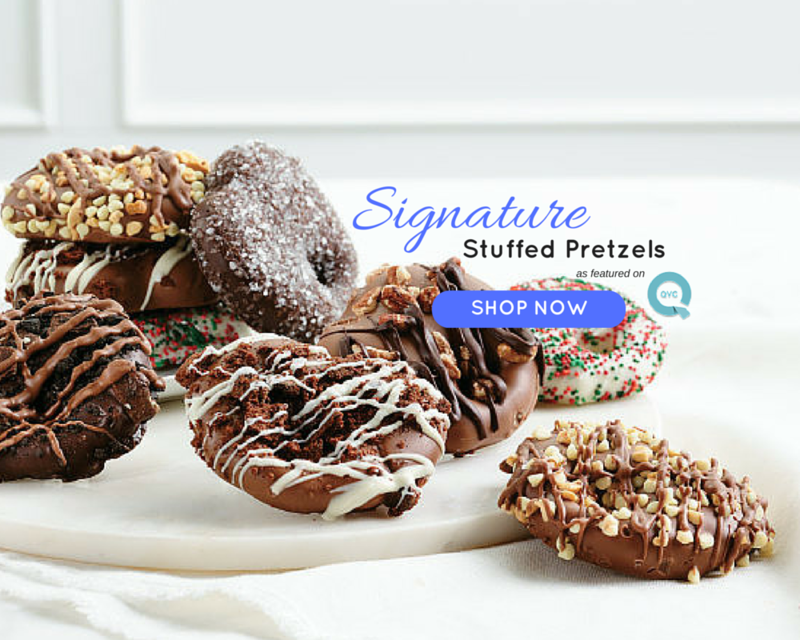 Did you know our awesome Signature Stuffed Pretzels featured on QVC are now Patent Pending?! We are excited that this process of stuffing, coating and topping makes these treats irresistible…and can’t be found anywhere else! Our new flavors include Peanut Butter, Caramel Pecan, Dark Mint Truffle and Brownie Truffle! So Delectable! Check out all of our QVC treats and order today! This is an indescribable Patent Pending creation! We take jumbo pretzels, stuff 2 of the openings with caramel, peanut butter or truffle filling, drench the pretzel in our luscious chocolate, sprinkle with yummy toppings then drizzle MORE chocolate on top! It doesn't get better than this! To date, we've sold MILLIONS of these treats! Some of our famous flavors include: milk chocolate peanut butter, white chocolate caramel, dark chocolate sea salt caramel and milk chocolate toffee truffle! Our new Holiday Stuffed Pretzels will tempt your taste buds with our new flavors including Peanut Butter, Caramel Pecan Turtle, Dark Mint Truffle and Milk Brownie Truffle! But hold on to your hats! Our Creation Station at Landies is dreaming up new flavors…stay tuned! See more products. Landies award winning chocolate starts with a 130 year old Swiss recipe using only the finest cocoa beans available in the world and harmoniously blending in real whole milk and choice ingredients, such as fresh locally roasted nuts, to create a delightful symphony of satisfaction. Check out some of our most popular milk and dark chocolate treats. See more products. Landies sugar free chocolate tastes so much like the real thing that we: "Dare you to Taste the Difference." Made with Maltitol, a natural corn based sweetener, our Truly Sugar Free chocolate will delight your taste buds. See more products.